Solgar Niacin is used by the body. Niacin is needed as a coenzyme in the production of energy. Niacin is essential to help maintain the health of skin, nerves and the digestive system. 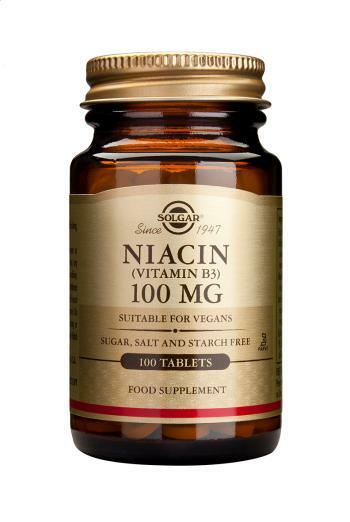 Niacin 100mg Vegetable Capsules is a B vitamin that performs many beneficial functions in the body, supporting energy metabolism as well as carbohydrate and protein metabolism. Niacin also contribute to nervous system health. As a food supplement for adults, one (1) Solgar Niacin 100mg tablet daily, preferably at mealtime, or as directed by a healthcare practitioner. Niacin may cause a temporary flushing of the skin, characterized by warmth and itching. dibcalcium phosphate, microcrystalline cellulose, stearic acid, magnesium stearate, cellulose gum.